Up to 120,000 people are believed to be imprisoned without due process, under inhumane conditions, for political reasons; an estimated 400,000 have died in such camps. Camp 14, also known as Kaechon Internment Camp, is a North Korean prison camp where political prisoners are confined for life while being forced to do hard labor under very harsh conditions. This is the place where Shin Dong-Hyuk was born and raised. The book, Escape from Camp 14, is written by journalist Blaine Harden. 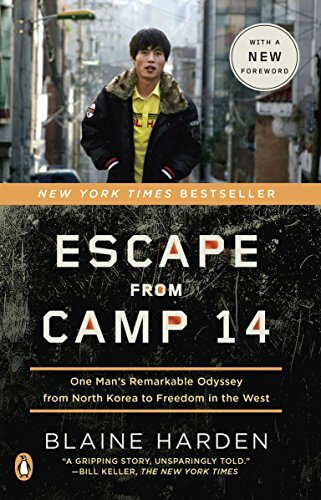 It is a biographical account of Shin Dong-Hyuk during and after his time in the camp. According to the book, Shin is the only known person to have escaped from a total control zone. Male-female relationships are strictly forbidden in Camp 14, unless granted by the prison authorities as reward for good behavior. A prisoner's marriage partner is to be chosen by the authorities. That is the case for Shin's parents. Like Shin, there are also many other children born inside the camp. Like their parents, prisoners' offsprings are never released from the camp. They attend schools within the camp where guards act as teachers. When they become old enough, like their parents, they too are forced to work. Shin's memories about the camp consist of starvation, public executions, torture, beatings, and hard labor. He never saw life outside the camp and believed the camp to be his only world. Getting a full stomach was his main goal in life - leading him to steal or forage for frogs, rats, or even undigested kernels from a cow's manure. Prisoners in the total control zone receive no luxury at all. They wear no undergarments (not even the female prisoners) and the poor-quality and ill-fitting prison clothes are rarely replaced. Despite doing difficult jobs under harsh conditions, they aren't equipped with proper protective gears. They rarely shower and never brush their teeth. Inside the camp, everything is controlled. Jobs are assigned to prisoners. Everyday, prisoners need to meet a certain quota for their work load. Simple errors lead to severe beatings or deprivation of the already meager food rations. Guards encourage prisoners to turn against their families, neighbors, and friends. A person gets easily caught with an offense as there are several informants - fellow inmates, that is - who snitch to the guards to gain their favor. Despite knowing only the life in prison camp, Shin decides to ran away. What he had to endure is truly remarkable and hard to imagine. Anyone who reads about the details depicted in the book will certainly realize how every little comfort of life can be taken for granted. It is also hard to believe how such inhumane practices still exist in the modern world.